Scotland is blessed with some of the best natural produce in the world, as well as a rich cultural heritage and breath-taking scenery. 2014 was a landmark year for Scotland and in 2015 there will be many more opportunities to experience the best that our country has to offer from the European Eventing Championships to the World Gymnastics Championships.We invite you to come and experience the rich culture of Scotland, the Land of Food and Drink. "Scotland. Where fresh is measured in minutes, not days." 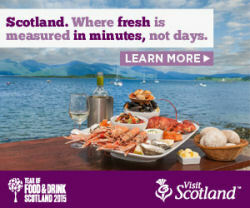 The Pierhouse Hotel is delighted to once more feature in Visit Scotland's campaign. As the hotel's owner Nick Horne said "We were very proud when a Visit Scotland photoshoot last summer featured two of our most favourite things.....our seafood grand platter and our stunning sea loch view here in Port Appin. The image appeared all over Scotland in the Brilliant Moments campaign. Now this year, we're featuring again in the Year of Food and Drink material. We're always happy to do our bit to promote seafood and the west coast of Argyll as a destination - the 'where fresh is measured in minutes, not days' headline says it all really!"